You are currently browsing the tag archive for the ‘Japanese pirates’ tag. This summer think about visiting the Seto Inland Sea(Seto Naikai) for an exciting, memorable and romantic family vacation. Innoshima was home to the Murakami Suigun (a word that means navy, but think “pirates” or “privateers”) that were active across the Seto inland sea between the Muromachi and Sengoku eras. So the trip would be an amazingly rich maritime history lesson as well as a visual feast to take in the soul-quenching seaside vistas. Recommended Activities: visit the Murakami Suigun castle (see photos above Courtesy: Rod Walters) museum and row one of the kohaya boats for free or participate in the Sea Festival, part of the Suigun Festival. People at the site can experience rowing the boats between 12:00 and 13:00 on the sea. (Location: Shimanami Beach). Catch the Sea Festival proper to watch participants compete with each other at the Kohaya Boat Race. 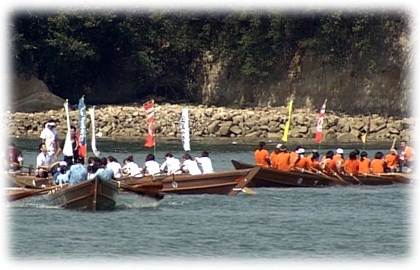 The boat race uses the wooden Kohaya boats that were used as messenger boats by the Murakami Suigun. Catch some adrenaline-pumping ancient pirate action being re-enacted! Kohaya boats are small boats that were frequently used by the Murakami Suigun. It is said that when ingenious strategies were devised, even the small boats were able to defeat war ships. The boat was reproduced to conduct the boat race at the Sea Festival. A total of 16 people, 14 oarsmen, one boatman and one drummer, are aboard. The participating boats compete on the 1.2 kilometer course. Over fifty teams participate every year. Starting in early July, practices by the teams can be seen almost every day. With the sound of drums coming from the boats on the sea, the scene has become a summer seasonal tradition of Innoshima Island. Innoshima Island, an island located in the center of the Seto Inland Sea, where the Murakami Suigun was active, was once a strategic marine transportation and trading hub. The Murakami Suigun used to conduct trade with Korea, the Ming Dynasty of China, and various other Southeast Asian nations between the 14th and 16th centuries. Its name was well-known inside and outside Japan due to its power on the sea. But the Murakami Suigun clan’s fortunes and power only began to wane in the latter half of the Warring States period, its power curtailed by regulations issued by central authorities that restricted the scope of activity for the Murakami Suigun. See this page. Who were the Murakami suigun? The Seto Inland Sea is a shallow sea separating the island of Shikoku from Honshu, the main island of Japan, and Kyushu. Currents are strong in the sea due to the large tidal range, complex topography, and the narrow channels and straits. The tidal range is between one and three meters in the east, and three and four meters in the west. Tides easily produce currents of a few knots, and when the tide changes, the surface of the water is dimpled with whirlpools and split by seams of roiled water due to the different heights of the sea floor. From a distance, the sea looks beautifully calm. Close up, it’s positively frightening. It was in this environment that the various suigun—feudal navies—arose and developed their unique livelihoods and culture around the Inland Sea. With their intimate familiarity with the currents that swirl between the many islands of the area and their prowess at fighting from boats, these sea dogs were pirates, coast guards, and local governments as time went by and depending on who you asked. The Murakami were based in the chain of large and small islands that straddle the sea between today’s Imabari in Ehime, and Onomichi in Hiroshima. This route is now linked by the Shimanami Kaido, an expressway with spectacular suspension bridges over the sea passages. 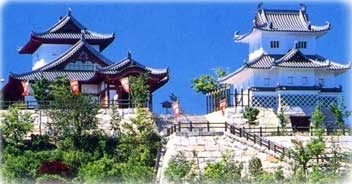 Since Innoshima Island was the main territory of the “Murakami Pirates” in the Middle Ages, you can find both the historic sites “Innoshima Suigun Pirates Castle” and the “Konrenji Temple” (the latter was the pirate’s family temple) are must see places. 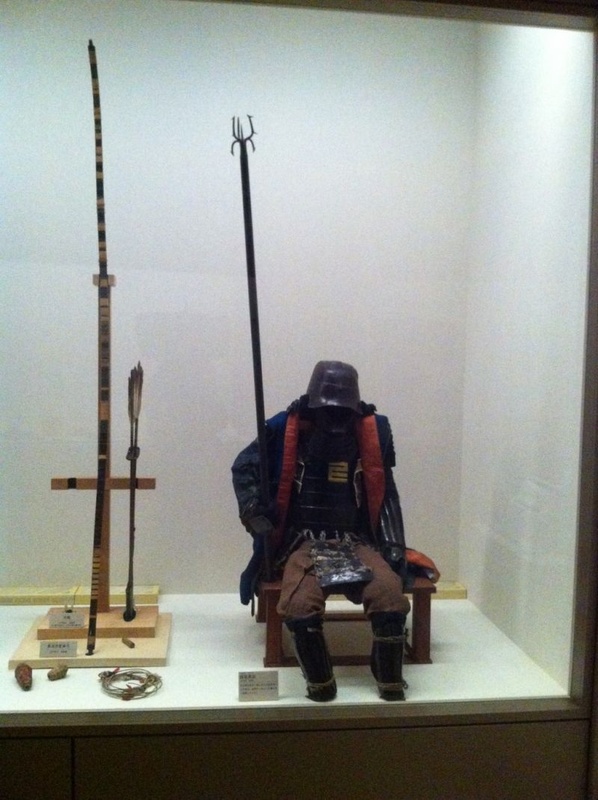 The Murakami Suigun Castle displays many weapons, armors, ancient documents, etc. that were left by the Murakami Sengun. The city of Onomichi has been prospering as a seaport town and is famous for its balmy temperate climate and picturesque hillslope scenery. Touristy but delightful activities include walking through narrow alleys, stairs and slopes of the quaint old part of town and losing track of time amidst the traditional scenery of Onomichi. Have fun in the early morning catching the sight of the fisherwives called “Banyori-san” pushing their carts to sell fresh fish in the central Onamichi central shopping district. There are a lot of alleys that criss-cross in the manner of a fishbone which connect to the main shopping street. Along the shopping street that lies east to west about 1.6km in central Onomichi, you will find less educational, but more touristy things to do like exploring the wide variety of shops such as ramen shops, Onomichi yaki shops, old-fashioned coffee shops, souvenir shops of Onomichi Hanpu (canvas)… Totally unscathed by WWII, the area is a magnet for authentic ancient temple- and shrine-hunters, for whom one popular trail the 3 km stroll of roads that start from Onomichi JR Station to the eastern side of town, that includes stone paved streets to reach Kairyuji Temple. The highest mountain on Mukaishima Island is Mt. Takamiyama which is designated as a National Park. Not to be missed is the 360 degree panorama view from the observatory at the top of the park … of the many islands in the Seto Inland Sea as ferryboats depart and return to the Onomichi waterway. The view of the Shimanami Sea Route and islands of Seto seen from the observatory are breathtaking…20 minutes by car from the central Onomichi area. The night view here is billed as one of the “Top 100 Night Views”. The coastal area along the Shimanami Kaido linked by bridges is one of the best coasts for a drive-holiday. The Nishiseto Expressway, commonly known as the Setouchi Shimanami Kaido Expressway, links Onomichi, Hiroshima Prefecture, with Imabari, Ehime Prefecture. 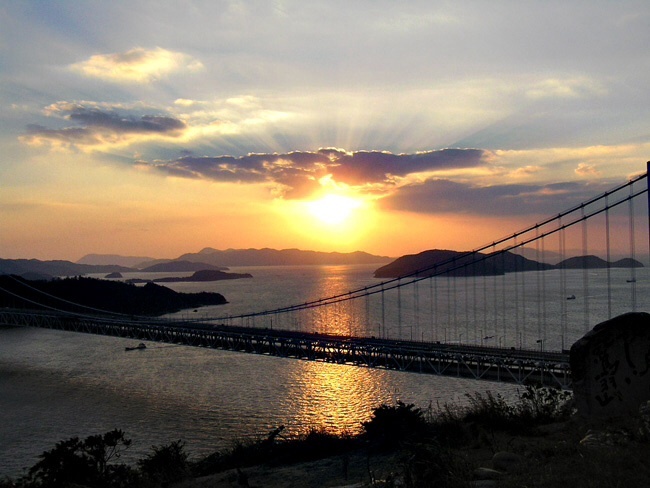 Known for breathtaking views from this bridge, it is a 60 kilometer-long highway exclusively for automobiles that links the islands of the Seto Inland Sea with nine individual bridges. Each bridge consists of a road way and a pedestrian walkway. The bridge connects six islands of the Inland Sea a.k.a. the Aegean Sea in Japan” between Honshu and Shikoku. Locals have especially been enamoured by the dotted islands and the gorgeous setting sun among the islands, all spiced up by, of course, its own pirate and maritime legends. (Almost 3,000 islands are located in the Inland Sea). This spot is one of the better-kept secrets of Japan but has long been touted in all of the camping and summer vacation family magazines as a fave and rave spot to take your family to …you can rent a bicycle at the terminals. Much featured in terrestrial TV programmes lately due to local celebrities’ visits to the area. The seaside resorts and campgrounds to be found on each island are filled with people in summer. With resort, boating, fishing or adventure camping activities to take your pick from.